Dec. 1 (Bloomberg) — A « significant quantity » of radioactive material was found in an Italian associate of Alexander Litvinenko, the former Russian spy who died after being poisoned with the same substance. The amount of polonium 210 found is of immediate concern as a risk to the man’s health, rather than a lower dose that may pose a latent cancer risk, a spokesman for the U.K. Health Protection Agency said today. Italy’s government said the man is Mario Scaramella, an academic. Scaramella met with Litvinenko Nov. 1, the day the former spy first reported feeling ill. The widening investigation into his death on Nov. 23 led to polonium 210 being found in at least 12 buildings, and five airliners have been examined. In a message just before his death, Litvinenko wrote that he was poisoned because of his criticism of President Vladimir Putin’s government, an allegation denied by the Russian leader. Pathologists today were autopsying Litvinenko’s body to establish how the radioactive isotope entered his body. Results won’t be made public until a coroner’s inquest resumes, according to Camden Council, the London municipality where the coroner’s court is sited. No date was given. In a separate case, Irish police are investigating the illness of former Russian Prime Minister Yegor Gaidar, who has also criticized Putin and who became sick when visiting Ireland last month. Russian doctors treating Gaidar believe he was poisoned, the Associated Press said yesterday, while Anatoly Chubais, Gaidar’s deputy in 1992, two days ago told reporters the former leader was suffering from an « unnatural » illness. Ireland’s Radiological Protection Institute is testing a university visited by Gaidar and the hospital that treated him before he returned to Moscow, RTE News reported. Scientists at the U.K.’s Atomic Weapons Establishment in Aldermaston, west of London, have traced the polonium 210 found in London to a nuclear power plant in Russia, the capital’s Evening Standard newspaper reported today. Officials at the establishment didn’t return calls. 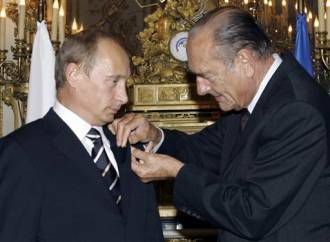 En septembre dernier, à l’occasion de la venue de Vladimir Poutine à Paris, Jacques Chirac l’a élevé au rang de Grand Croix de la Légion d’honneur. Cela s’est passé dans les salons de l’Elysée.